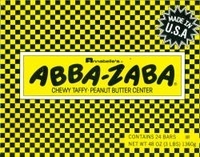 Abba zaba candy bar is a chewy vanilla taffy bar filled with peanut butter. 24 2oz Abba Zaba taffy candies Made in the USA by Annabelle Candy Company. Many may not remember the name of this nostalgic candy, however you however you may remember it as the bar with the yellow and black checkerboard wrapper. Each box has 24 2oz. bars. The TV slogan for these yummy taffy bars is " One Won't Do, You Better Buy Two". Even though they have been around for over 75 years they are still a nostalgic candy favorite today. If you have ever watched the following movies Half Baked, Gilmore Girls or Two and A Half Men you might remember seeing Abba Zaba�s, as they were featured.